isubscribe Managing Director Hunter Drinan offers an alternative view of the magazine market, and suggests onward growth for publisher subscription models in 2017. When thinking about the magazine market, the phrase 'don't judge a book by its cover' comes to mind. With unending opinion and speculation about the state of magazine retail sales, you could be forgiven for thinking the market’s decline is terminal. However, from what we have observed at isubscribe in 2016 and over 15 years at the frontline of subscriptions, there is a lot more nuance to the current state of play than is reported and, in the case of subscription sales, plenty of positive news. While retail sales in the areas that isubscribe operates in – Australia, New Zealand and the UK – are indeed sliding, subscription sales are moving in the other direction. isubscribe - the leading brand in those three markets, generating over five million subscriptions since launch, and having worked with more than 1,200 publishing houses - have enjoyed consistent year-on-year growth since 2001. And that growth in subscriptions is being felt across multiple categories, not a select few. Of our top 10 sectors, 60% are showing an uplift in volume, from single-digit increases in Food & Drink, Lifestyle, International and Motoring, to a 17% improvement across the Kids & Teens market. Indeed, growth in sales of titles targeted towards children has been evident for the last 18 months with, for example, National Geographic Kids a popular gift choice for older buyers looking for non-digital gifts for younger relatives. In the General Interest category, which offers an eclectic array of titles including National Geographic, that’s life! and Smith Journal, subscriptions have grown by a quarter. Of the four categories experiencing a decline in subscription rates, only two (Sports & Outdoor and Health & Fitness) show a depreciation of more than 3%. A closer look at what is driving growth at isubscribe reveals the most exciting activity is in niche magazines. These titles are growing at a much greater rate than mass. Most recent evidence is provided by the strong growth titles experienced during isubscribe's Christmas 2016 campaign. 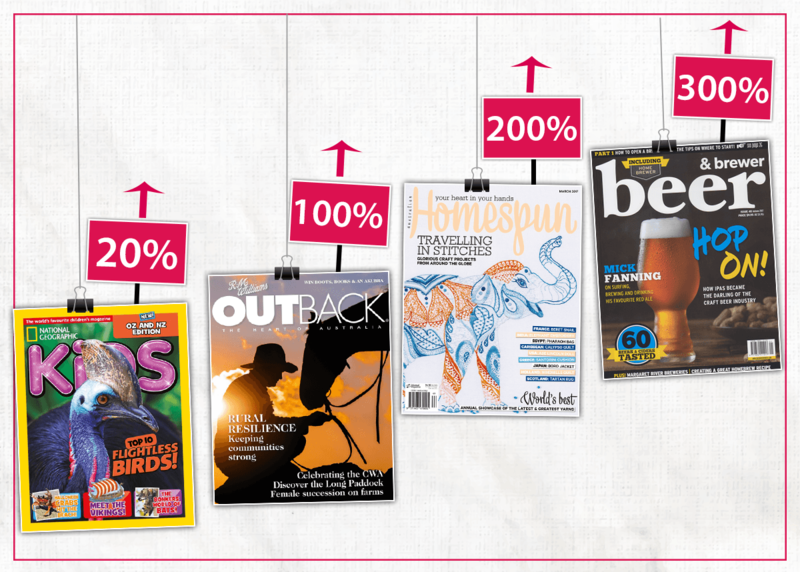 Top performers included Beer & Brewer magazine (a three-fold increase in subscription sales), Australian Homespun (a two-fold increase) and R.M Williams Outback magazine, which boasted a 98% uplift. These results are not actually surprising in a retail universe increasingly meeting the demands of customised and personalised products and services. Niche titles are specialists, and offer a unique point of view that resonates with particular communities of readers and interests. We're observing it’s these titles where customers are more frequently finding inspiration, and magazines that consistently top the rankings in terms of volume, such as Better Homes and Gardens, aren’t where we are seeing current growth. There are however, some exceptions of long-standing, popular print titles that are growing subscriber numbers. donna hay magazine has been running for over 15 years and for Christmas, posted a 19% increase in volume compared to 2015. Country Style earned itself an 11% uplift in subscriber numbers over the Christmas period as well. These are impressive numbers and should provide further cause for reservation when discussing magazines' demise. While deciphering consumer behaviour is part and parcel of understanding performance, we do observe rewards for active publishers who regularly refresh and change up their subscription offers. Proactive marketing keeps titles looking fresh and affords more opportunities for promotion. To complete the picture, a discussion about magazines, subscriptions and publishing must include digital. Digital subscriptions are often automatically posited as the growth area and the alternative most likely to impact print magazine consumption habits. Digital is certainly a worthy addition however it's perhaps not the enemy we feared it might be, accounting at isubscribe for just 0.9% of total publishing market sales in 2015 and rising to a disappointing 1.2% in 2016. The desire for the tactile, print product is clearly still an important factor for most magazine readers. It's somewhat of a paradox therefore, that isubscribe's advantage lies in its online convenience for subscription sales and the range of titles we offer, including digital options, makes isubscribe an appealing go-to destination for magazine shopping whether for personal or business consumption or to arrange a gift. In 2016, isubscribe saw growth across all its territories - that’s growth in subscription sales across the broadest range of titles assembled under one brand. This is pleasing for a small business operating in a 'declining category', however more importantly, we believe it’s good news too for the magazine market as a whole.